← If real-time reporting in mobile advertising is key, why aren’t more businesses demanding this? The Crazy Frog was the mass market phenomenon that launched ringtones into the mass market in 2004. Within two years, it is estimated that it generated sales in excess of $400 million dollars for Jamba (which became part of Verisign and ultimately Fox) and other affiliates – by direct sale of a single ringtone. 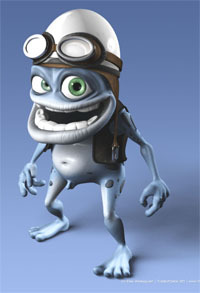 Crazy Frog sales were £40 million in the UK alone in the first year making up 40% of UK ringtone sales. It was then used by Jamba/Jamster to encourage subscriptions to other ringtone services. Up to 50 million users worldwide (up to 6 million in the UK alone) downloaded one or more Crazy Frog variants within two years to their phones. The Crazy Frog spawned a range of musical hits, including a remix Axel F which remained in the European music charts for months in 2005, not to mention the plush toy spinoffs. More importantly, extensive reporting of the Crazy Frog across mainstream media such as tabloid newspapers, mainstream TV news and even the broadsheets brought the idea of ringtones to the mass market – beyond its teen appeal. When Bango floated on the UK stock market in mid 2005, a year of Crazy Frog success made the idea of mobile content more plausible to investors and helped our successful float. The Apple App Store seems to be on the same track. Although Apple is very secretive, the App Store may be managing to achieve similar sales growth to the Crazy Frog over its first year or so. While Apple’s sales are a tiny part of the overall multi-billion dollar mobile app and content market, since it is restricted to 20 million or so iPhones/iTouches it has captured the imagination of journalists and the technorati. It has re-invigorated interest in app stores among other phone makers and even breathed some life into operator portals. While handset specific app stores may in reality prove to be just a passing fad that can be surfed as progress continues towards a web centric model, one could level the same charge against “The Annoying Thing”. The recent furore over Apple selling a “shake the baby to death” application echoes the problem the Crazy Frog had with its exposed genitalia, just the sort of PR to help get mainstream attention. A quick Google search will also demonstrate that the sense of humour of iPhone users are not much different from the mobile phone users of 2005! I expect we will look back in 2-3 years time and realise that despite all the other activities from operators, brands and music companies it was the Apple App store – by then still a small part of the overall market – that gave the content industry the boost into the real world that it needed back in 2009. This entry was posted in app store, mobile payment, mobile web, off portal, trends and tagged iPhone, mobile phone, Nokia, ringtone, sales, SmartPhone. Bookmark the permalink. 1 Response to Could the Apple App Store overtake the Crazy Frog?